The CPCS Annual Training Conference will be held on Thursday, May 14, 2015 at the DCU Center, 50 Foster Street, Worcester. Advance registration is required. Over the course of the day there will be a wide variety of programs of interest to criminal, juvenile, child welfare and mental health attorneys. At midday we will gather to hear remarks from Chief Counsel Anthony Benedetti. Late in the afternoon we have set aside time for networking sessions. In years past we have presented a number of awards at the Conference. This year CPCS awards will be presented at a separate Awards Ceremony on May 5, 2015. Solicitation of award nominations and further details will be provided soon. This entry was posted in Criminal Defense, Training on February 26, 2015 by dkrupp. This entry was posted in Mental Health on February 26, 2015 by Mark Larsen. Indigent parents have a constitutional right to counsel in private guardianship-of-a-minor proceedings. The SJC recently held in Guardianship of V.V., 470 Mass. 590 (2015) that indigent parents have a constitutional right to counsel in private guardianship-of-a-minor proceedings. A summary of the case and a link to the full opinion can be found here. This entry was posted in Children and Family Law on February 23, 2015 by jprince. On January 31, 2015, longtime CPCS employee, Pamela Jean Webb of Springfield, unexpectedly passed away. Pam worked as an Administrative Assistant at CPCS for 32 years. Here is a fond remembrance of Pam from Alan Rubin, the Attorney in Charge of the Northampton office. “After working for several years in the Springfield office, Pam came to Northampton as AA soon after this office opened and has been with us for 25 years. She really has been the heart and soul of this office. In our small office she has had to perform the roles of AA, secretary, receptionist, answering the phones, and many other tasks, but much more than this, her kindness and wisdom supported and guided all of us who have worked here. In our office we share case discussions amongst all of us and frequently Pam’s common sense insights helped focus the attorneys on the best way to proceed with difficult cases or problem clients. Outside of the office Pam was a wife, mother, grandmother, and sibling. She was not only the matron of her own extended family but was always acting in that same role for neighbors, friends, and others who came ‘under her wing’. She was a community activist, working as a strong, determined, and persistent advocate on many issues of importance, but most particularly on issues involving education and on the needs of teen-age single mothers. Pam was planning to retire in a few months and was very much looking forward to future projects in these areas, as well as spending more time with her family. It is incredibly sad that she did not have the opportunity to accomplish these goals. Everyone who would call or visit this office would comment on the very pleasant way that Pam would respond to callers. But this was not just a ‘phone persona’, she was like that in all her interactions with people—strangers as well as friends. This pleasant and calm personality was in no way an indication of weakness, as she was a very strong and forceful fighter for the things that mattered to her, as some recalcitrant school officials in Springfield learned to their discomfort. 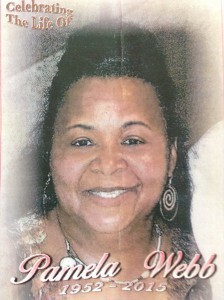 A memorial service, celebrating Pam’s life, was held on February 6, 2015. Many from the CPCS community attended the service. This entry was posted in Criminal Defense, Human Resources, Public Defender Division on February 22, 2015 by Randy Gioia. This entry was posted in Mental Health and tagged CLE, Mental Health, MHLD, Training on February 20, 2015 by Beatriz Juarez.